A Daley Labor Government, if elected this month, will embark on an unprecedented $7.4 billion school building program. Labor is committed to building and upgrading 204 schools right across NSW as part of the largest investment in public schools in NSW history. NSW Labor Leader, Michael Daley, said it is part of Labor’s investment into our schools that will put our children’s future before Sydney stadiums. “Labor can afford this record investment into our public schools because we will not proceed with the Liberals and Nationals’ $2.2 billion Sydney stadium splurge. “Labor will make sure school infrastructure keeps up with the booming school-aged population,” Mr Daley said. By 2036, it is estimated there will be one million students enrolled in NSW public schools, an increase of 200,000 students compared to today. Already, 636 NSW schools are at or above 100 per cent capacity. It comes on top of Labor’s commitment to replace 1,000 ageing demountables and to ensure that every new school built has childcare or before-and-after school care facilities. Currently, there are 4,640 demountable classrooms in NSW schools and the Liberals and Nationals have recently purchased 520 more rather than investing in bricks and mortar classrooms. Yesterday, Mr Daley announced Labor’s plan to hire an additional 5,065 teachers to keep up with demand and provide the best opportunities for our children. Air condition every school in NSW. So THAT is why Gladly Back-flip-I-can has pushed on with the demolition of the Sydney stadium … to ensure that Minister Stuart Ayres gets BOTH a Parliamentary retirement package AND an executive job at the NRL after politics. Well, that’s what Liarbrals do … look after their corporate mates … hoping for personal benefits. Remember former Premier Mike Baird sold off the NSW Land Titles Office to a consortium of banks then received a reported $2 MILLION Per YEAR JOB from a bank after retiring from politics. unprecedented??? check the gfc cash tied to schools because labor couldn’t trust the state government. Check how much went to private schools, many on a rort, then check how many NEW catholic schools were built in regional ares? 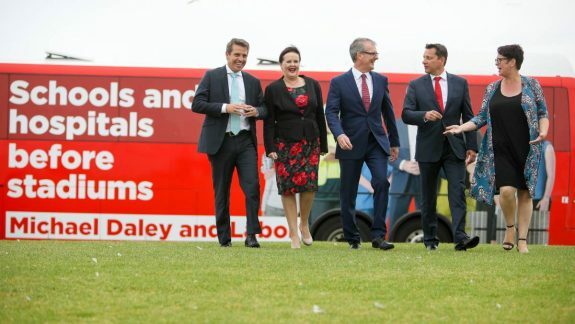 Labor wont have any trouble finding unemployed teachers the vicechancellors have been taking bums on seats with little regard to quality for years. They are recruiting so successfully that there are thousands perhaps tens of thousand of functionally illiterate and enumerate students but learning a second language is as important as learning the first and sounds better. Demountable classrooms are a reality for many students.It has been so for the past eight years in New South Wales. Count the students who turned 18 before March 2011 and those who studied in demountable’s every year since and are now eligible to vote, and you have the making of a landslide. Because those who turned 18 in 2011 know full well their kids face school life in a demountable. Every Premier/ Chief Minister or wanna be one should take a leaf out of Daniel Andrew’s book in how to win elections… it is not rocket science! ………………………. Oh yes, London Bridge has always been falling down, and educational standards with it. No wonder there are people who still believe that the idiot Left has marched through schools and is corrupting the students with notions of climate change and other lies. What the Murdoch media fails to understand is that students can learn about climate change from sources other than teachers. That is why the Murdoch media hates social media and insists on featuring denier rubbish to comfort the climate ignorant who read nothing but Murdoch scribble. Education is a favourite political football – and everyone can be a player.